A long stretch of miles ahead and solitude are the two key things that Leslie Iverson, TransAm company driver, enjoys most about her profession. After working in a variety of different customer service positions, Leslie decided it was time for a career pivot: the trucking industry. 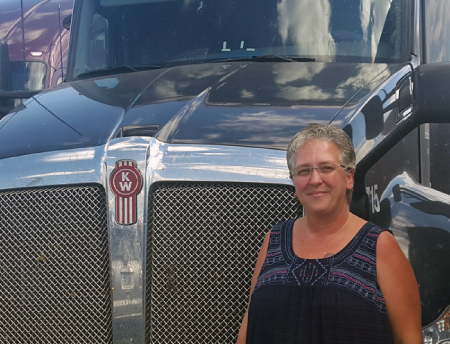 Always one for a challenge, Leslie immersed herself in a training program and earned her CDL to take on the open road. As Leslie pointed out, being a new driver has its obstacles, and it takes an especially disciplined person to navigate an 80,000 lbs. truck. But Leslie attributes the road blocks starting out to what made her stronger, not only as a person but as a driver. “When you are a new driver, it can be a difficult transition at first, but I am a strong person, I’ve been through a lot, and I knew I could conquer the obstacles ahead.” This type of inner strength highlights what makes Leslie such a successful driver and a role model for women who are also looking to join this male-dominated industry. As Laurence Sterne once said, “In solitude the mind gains strength and learns to lean upon itself.” And that is definitely the case for Leslie, whose strong work ethic and determination has kept her persevering through her initial training and now as an established company driver. Thank you Leslie, for your continued dedication to your profession and to the TransAm team, you serve as an inspiration to drivers everywhere.